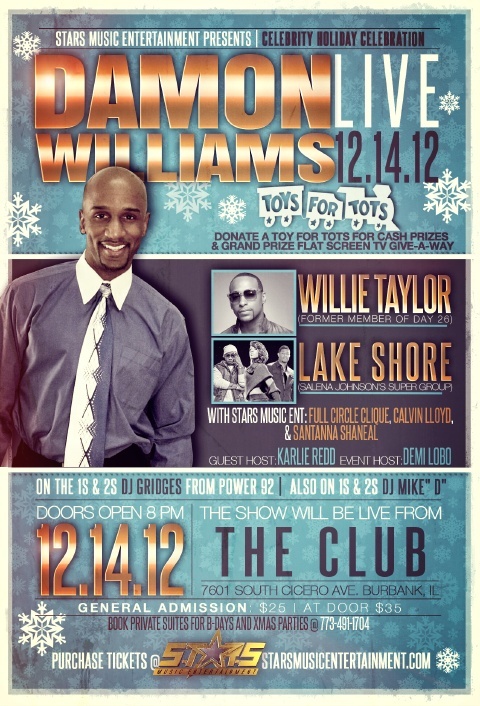 Veteran comedian Daymon Williams will headline Stars Music Entertainment’s Celebrity Holiday and Toys For Tots Gift Drive on December 14th at The Club in Burbank, Illinois. R&B artist Willie Taylor and Syleena Johnson’s group Lake Shore will also perform. The event will be hosted by recording artist and WGCI radio personality Demi Lobo and rap artist/reality personality Karlie Reid (from Love and Hip Hop Atlanta). Daymon Williams has been on TV numerous times, including appearing on BET’s ComicView annually since 1994, hosting several episodes of Showtime at the Apollo, performed as the opening act for the highly successful Kings of Comedy Tour, and attended the US Comedy Arts festival in Aspen. His universal material regarding relationships and growing older is sure to relatable to any audience. Chicago R&B artist Willie Taylor is an American singer and songwriter, known by some from his appearance on P. Diddy’s “Making The Band” reality show and his former membership in group Day 26. He was also a former member of the Chicago based group Kwiet Storm for 10 years before leaving for a solo career. Taylor has worked with the artists Avant, Ginuwine, Jagged Edge, and Joe. “Divas” star Syleena Johnson’s discovery, R&B trio Lake Shore, is comprised of members Malone, SandyRedd and Tommie B. Lake Shore met Syleena while she was recording her album, Chapter V, and contributed with songwriting and background vocals. The new trio is currently in the studio working on their debut EP. The Club is located at 7601 South Cicero Avenue; Burbank, Illinois. Tickets can be purchased in advance through Stars Entertainment Group for $25 or at the door for $35.